theswca blog: Kenner Kids Vol. II: "The super-8 film never tangles!" Kenner Kids Vol. II: "The super-8 film never tangles!" Well...Jimmy here isn't actually shooting film, but viewing it. I've been fascinated by the Kenner MovieViewer ever since I first saw one in person while visiting the actual "Toy Chamber" of Todd Chamberlain's this past summer. I think of them as the second generation View-Master in that the illusion of movement is achieved by a device that mimics hand crank movie cameras rather than the View-Master's simulated shutter and click of a still camera. 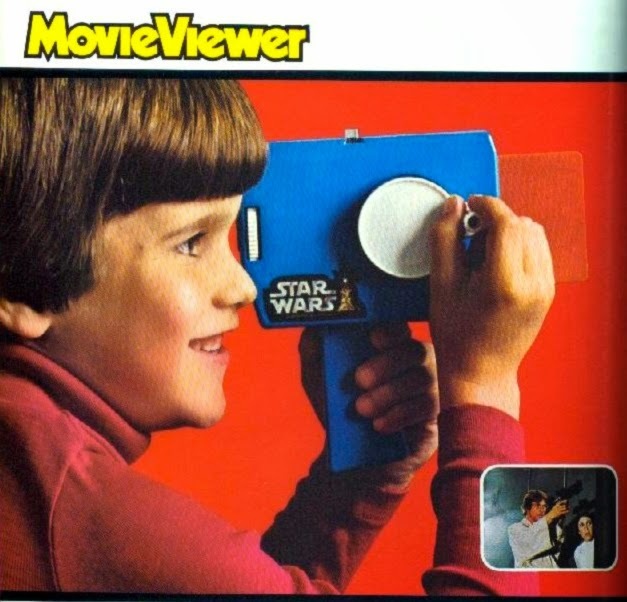 Though the Star Wars manifestation of the MovieViewer was released in late 1977, the toy itself, much like many of the film's early licensed items, was merely an easily adaptable retread from Kenner's existing repertoire (we'll pick up on this theme further in future posts in the series). This particular image is derived from the 1978 Kenner Retailer Catalog, which makes a point of mentioning that "The super-8 film never tangles! No batteries needed." Though modern parents needn't worry about their kids' Nintendo DS game cartridges tangling, they'd likely appreciate the absence of battery burden with old "analog" toys like this.